A staggering amount of time and work goes into the creation of a full length album. In today’s musical landscape, the instant gratification afforded by the Internet demands that musicians frequently and consistently release singles in order to stay relevant, while the effect of streaming’s preeminence upon royalties entails that artists must now tour more than any prior point in music history. To release a single LP amidst the current state of the music industry is a huge accomplishment; passing the ten album milestone is nothing short of legendary. For a referential frame, Led Zeppelin’s discography spans nine albums, while The Who have released eleven to date. Bassnectar’s newest album, Unlimited, is his twelfth to date. Since proffering his debut album Freak Beats for the Beatfreaks in 2001, Lorin Ashton has released a full length album almost every single year. Though Ashton took breaks from releasing albums in 2006, 2008, 2010, and 2013, he released five EPs during this time, as well as a slew of singles and remixes amidst a perennial touring schedule. Since launching his career, Bassnectar has essentially been in a perpetual state of production and performance, earning him the status of being one of the busiest — if not the busiest — figures in dance music. Given the absurd productivity of key electronic influencers like Boys Noize, Skrillex, and Diplo, the aforementioned title is not received lightly. Considering Bassnectar’s inhumanly high level of output, it’s inevitable that some of his albums will be less astounding than others. After all, Led Zeppelin released In Through the Out Door and The Who released It’s Hard — respectable albums that fall short of the grandiosity of their overall catalogues. Neither of these acts had the frequency of output or performances with which Bassnectar has blessed his fans, but neither band lost credibility or legendary status due to subpar offerings. Standing at a formidable length of fifteen tracks, Unlimited has some exceptional moments. That Bassnectar’s twelfth album is one of his less enthralling works is less of a criticism of the album itself, and more of a testament to how awe-inspiring the entirety of Bassnectar’s expansive catalogue and extensive touring history is. Overall, Unlimited seems like a sort of recapitulation of Bassnectar’s earlier works. As one might expect, the album’s style vacillates between aggressive bass music and mesmerizing melodies. The album also sees Lorin recruit many of his list of usual suspects for collaborations: Glitch Mob, Zion I, Rye Rye, Lafa Taylor, and G. Jones all make appearances over the album’s course, while Jantsen is a notable absentee. 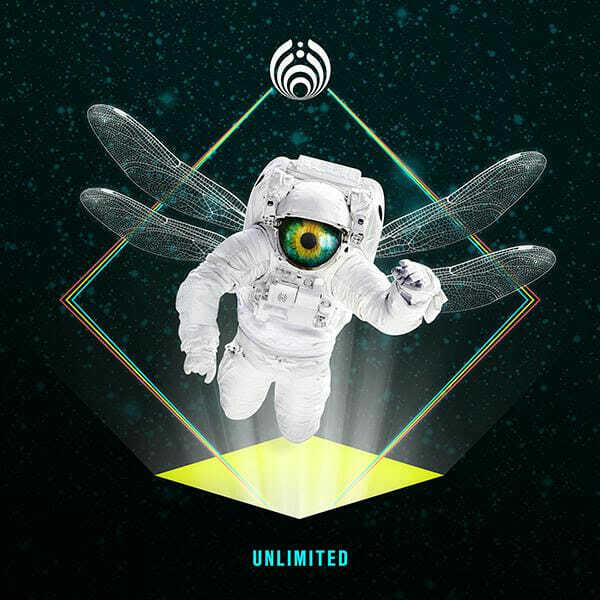 Arguably, the most successful collaboration on Unlimited is “Level Up,” which features Levitate (a collaborator on Ashton’s 2015 album Into the Sun) and Seattle-based rapper Macntaj in his first Bassnectar collaboration. Through its uniquely implemented and high octane use of Arabic quartertones, “Level Up” manages to be one of the album’s energetic peaks. For the most part, the album is its best when Bassnectar opts to compose on his own. The half of Unlimited where Bassnectar flies solo yields some of its strongest selections, from the long-anticipated, trap-infused anthem “Zodgilla,” to the enchanting mystique of his remix of CryWolf’s “Rising, Rising,” and finally to the LP’s closing selection, “Inspire the Empathic,” a mellifluously lighthearted cut which plays upon Bassnectar’s production process from conception to completion. The aforementioned songs comprise the album’s highlights, but therein lies the crux of why Unlimited falls short in the spectrum of Bassnectar’s majesty. None of these songs deliver the same impact as the core songs from Underground Communication, Cozza Frenzy, or Divergent Spectrum. It’s not insignificant to note that all three of these albums — arguably his strongest string of LPs — followed “gap years” in Ashton’s LP discography. Though no Basshead would ever dream of complaining that Bassnectar releases too many albums, it’s hard to deny that his work — like that of any artist — is at it’s most thoughtful when given more time to develop. Summarily, Unlimited is a decent album. Outside of the unreasonable expectations that have risen from Bassnectar’s unprecedented legacy, it is a strong album. However, Ashton’s twelfth album is largely self-derivative and somewhat more hollow than much of his prior catalogue. Lorin’s next album will likely be more inspired, and more inspiring, if he takes two years to develop its oeuvre from conception to completion. Conversely, for anyone to determine Bassnectar’s trajectory aside from himself would detract from the amorphousness that gives him appeal in the first place. At the end of the day, it goes without saying, we are never ungrateful for the release of new music from bass music’s highest purveyor.